Greece stands on the crossroad of three continents (Europe, Asia, Africa), connecting, since early antiquity, people, goods and cultures. For that reason, Greece has long been a strategic node for transportation in the greater region. More specifically, maritime transport is the most important mode of global freight transport, accounting for 80 per cent of global trade by volume and over 70 per cent by value. According to a recent study, container throughput in European ports is growing at 6% annually, while traffic through South-East Mediterranean ports has been growing at more than 8% annually. In this environment, Greece’s geographical position as a gateway between East and West render it highly attractive for investments in logistics and transport to take advantage of these increasing trade flows in an efficient and cost-effective manner. 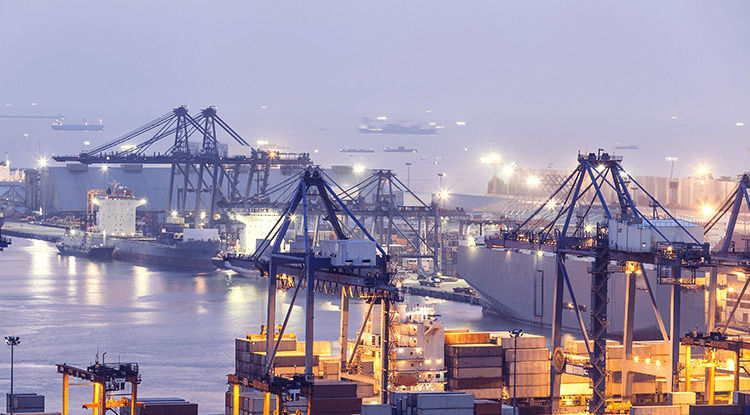 Overall, Greek ports are strategically located and could easily be transformed into regional logistics hubs for goods travel from Asia to the European Community. The main port of Greece, Piraeus is a large port with significant capacity both as a container port and as a car terminal. It is also close to the main Mediterranean maritime route (210 nm) and provides access to a large logistics center in Thriassio and a high-speed cargo train route leading into Europe. All this allow Piraeus to serve both as a transshipment center and a gateway port to Europe. From 2010 on, the Piraeus container port and car terminal started a remarkable recovery path partly due to the arrival of COSCO Pacific, which acquired OLP SA. Piraeus ranked 3rd, in 2017, among Mediterranean commercial ports, and 38th internationally, with a total capacity of 3.6 million TEU. Piraeus’ increased capacity and efficiency, its new cargo train connection to Europe and the shorter, more direct access to Asia through established shipping routes has established Piraeus as the premium import point from the manufacturing countries of Asia (China, Japan, Korea, India) to Europe. Other Greek ports with the capacity to become gateways to Europe include Thessaloniki, Alexandroupoli and Patras. The opportunity for major global manufacturers to use Greece as an assembly, logistics and quality assurance center for their products manufactured in Asia and sold in Europe. The potential for Greece to become a major logistics, distribution and assembly hub for Europe has been recognized by major investors such as Chinese COSCO, which has heavily invested in the Piraeus port . Also, significant is the agreement between the Greek Rail company TRAINOSE, recently acquired by Ferrovie dello Stato Italiane, and HP for the exclusive transport of HP goods coming through Piraeus to the European markets. Following the same path, Huwaei established a pilot distribution center in the Port of Piraeus whereas ZTE Corp has also developed a logistics center in the Port of Piraeus. Competitive Freight Costs - The geographical position of Greek ports allows the offering of competitive sea freight cost for transported containers, while offering access to a set of growing economies in the broader region. Transport Infrastructure - Continuing investment in road and rail infrastructure means that Greece’s major ports are now directly interconnected with modern road and rail links, facilitating intermodal transport of cargo onwards to their final destination quickly and cost-effectively. Under the new European Infrastructure Policy (TEN-T) more than 26 bn € will be invested in European infrastructure, including railway, road, port, airport and multimodal infrastructure projects in Greece. Advantageous Location: Greece is part of the EU’s Orient/East-Med Corridor that connects the maritime interfaces of the North, Baltic, Black Sea and Mediterranean. World Champion Shipping Sector: Greek ship owners control the world’s largest merchant fleet. Know-how and skilled labor – Greek manufacturing and maritime tradition ensures the availability of skilled logistics and assembly employees for the staffing of local distribution centers. Efficient global logistics providers: Several global 3PL providers such as Kuhne & Nagel, DHL, Schenker, Geodis, Panalpina, and Express are currently operating in Greece, Recently, a logistics network funded by the Hellenic Federation of Industries (SEV) has been created, to improve collaboration between logistics providers and the rest of the Greek economy.